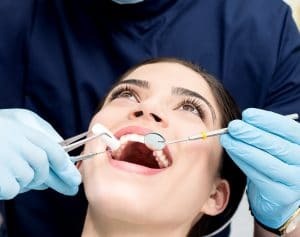 In most cases, professional dental treatment is only recommended as necessary and tailored to meet each patient’s unique needs. However, professional dental cleanings are one procedure that everyone needs on a routine basis. Like brushing and flossing your teeth at home, professional dental cleanings focus on removing harmful oral bacteria from your teeth and gums. Otherwise, they’d linger long enough to compromise your healthy tooth structure and gum tissues. Today, we examine the importance of preventive dental cleanings, and why you shouldn’t skip a single appointment on your schedule. The reason why everyone needs routine dental cleanings is because harmful oral bacteria are a threat to everyone’s smiles. As natural inhabits of your mouth, these bacteria constantly accumulate and form plaque on your teeth and gums. When you skip brushing and flossing your teeth, or if you just miss a spot of plaque unwittingly, it can quickly calcify (harden) into tartar. Once it does, your toothbrush won’t be able to remove it anymore. Tartar is insoluble, and only your dentist or hygienist can remove it with professional dental equipment. Because oral bacteria are a constant threat, teeth cleaning only works when it’s just as consistent. All it takes is one slip and oral bacteria can lead to tooth enamel erosion, gum tissue infection, chronic bad breath, and more. When you skip a teeth cleaning appointment, the damage that oral bacteria can do in the meantime can undo all of your previous preventive efforts. Sticking to a regular schedule of professional dental cleanings is essential to keeping your teeth as beautiful and healthy as they should be. To learn more, schedule an appointment with your dentist by calling Keelan Dental in Butler, PA, at (724) 285-4153. Our Smile Certified experts happily serve patients from Butler, Cranberry Township, Mars, Pittsburgh, Butler County, and all surrounding communities.